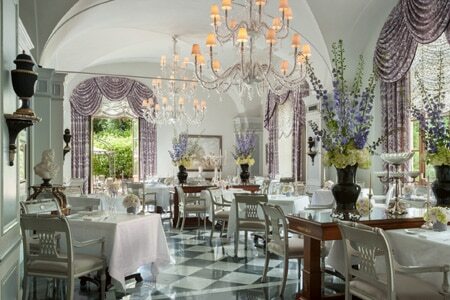 Experience chef Vito Mollica’s tasting menu in this Four Seasons Hotel Firenze restaurant. : Just a short walk from the city’s center, Il Palagio in the Four Seasons Hotel Firenze boasts a dining room with giant doors that open into the garden where guests may eat al fresco during the warm months. Even if the menu from chef Vito Mollica is rather limited, the choices reflect the season and freshness of the ingredients. Your best bet to experience the art of the cooking of chef Mollica and his staff is to order the special five-course tasting. For a starter, enjoy the gazpacho with avocado and shrimp or the black truffle risotto. Fish-lovers might like the line-caught sea bass with artichokes, while the meat main courses include a pressed forest chicken or a chamomile-scented lamb with pecorino cheese. The black currant soufflé with fior di latte ice cream sounds intriguing and doesn’t disappoint. Most desserts include homemade ice cream. Il Palagio offers a large selection of (mostly Italian) wines, many available by the glass. Private dining for two in a romantic setting on the roof terrace overlooking the city and the hills around Florence, and a private table for a party in the gardens, are just a couple of the possibilities that distinguish Il Palagio. Service is impeccable.